Looking for easy snowman crafts for kids to make with your children or your classroom this winter? These fun snowman craft ideas will the kids busy and give them a fun creative outlet. Plus, arts and crafts projects help to improve fine motor skills! Snow got you and the children stuck inside? 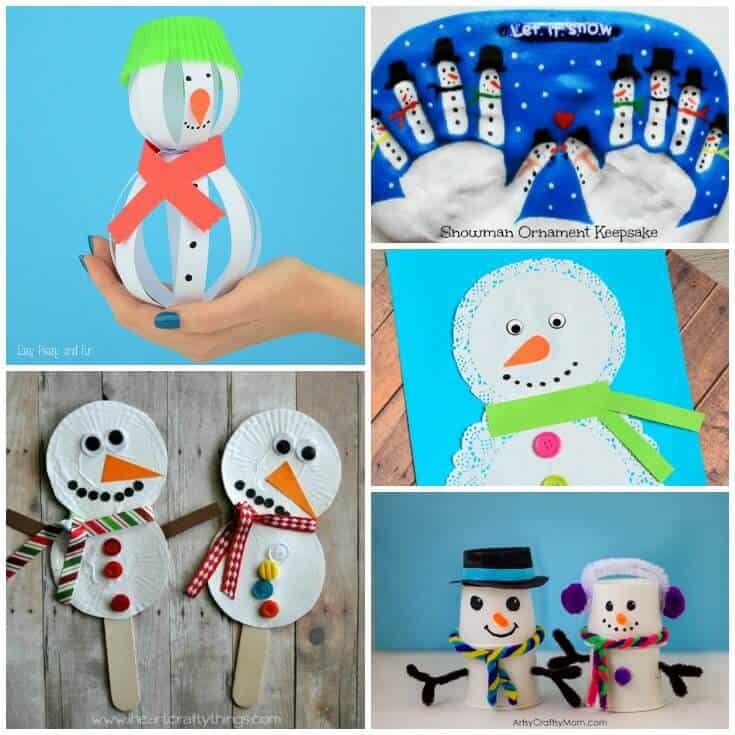 Why not celebrate winter with these fun snowman crafts!? From a salt dough snowman keepsake to snowman christmas ornaments, there are wonderful snowman craft ideas here for children of all ages. You will find easy snowman crafts perfect for toddlers as well as more advanced projects fit for older children. Many of these winter craft projects are made with items you likely have around the house such as paper plates, paper cups, popsicle sticks, buttons, construction paper, etc… Other projects will require some additional supplies that you can find at your local craft store or on Amazon. The finished snowman craft projects make great winter themed classroom decorations or decorations for the home. To view the complete step-by-step instructions for each of these snowman crafts just click on the link below. I hope that you and your family enjoy these fun snowman crafts for kids art projects! I love these snowman ideas!! Great crafts for Christmas Eve. Snowmen have always been one of my favourite holiday figures. These crafts are adorable! These are so cute. I can’t wait to try them. Even though we hardly ever get snow, I love snowmen.